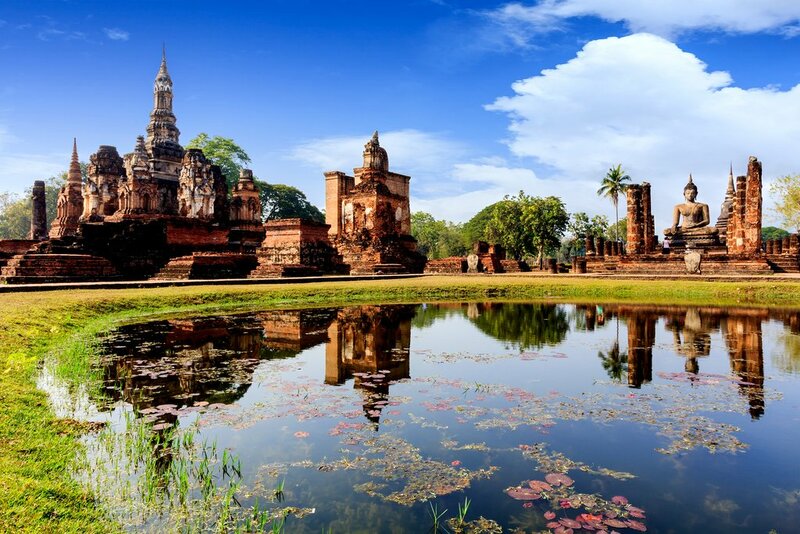 Arrive in the magnificent ancient city of Sukhothai in northern central Thailand in the late afternoon. After settling into your hotel, you're in for a delicious, authentic Thai dinner. Sukhothai is known as the former capital of the Kingdom of Siam in the 13th and 14th centuries, but it's also famous for its own style of noodles with surprisingly addictive flavors. Sukhothai noodles are thin rice noodles topped with with pork slices and crackling, long beans, peanuts, and lime juice for a complex, bold taste. Try it with or without broth for an unforgettable meal. In the morning you'll travel to quiet Kamphaeng Phet, a nearby town and UNESCO World Heritage Site. 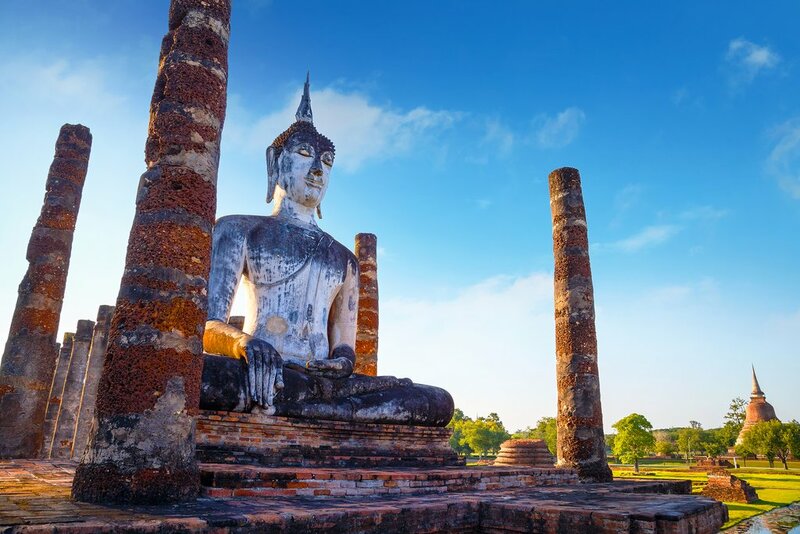 Once an essential defensive bastion of the Sukhothai Kingdom, the fortress now makes for a fascinating archaeological park overlooked by most travelers. Hop on a bicycle and ride around the fortress and temple ruins. You'll stop to explore Wat Phra Kaew, the 15th century royal Buddhist temple where the king would pray. Enjoy lunch and refuel at a popular local spot, and then return to your hotel in the afternoon for a dip in the pool and an escape from the midday heat. 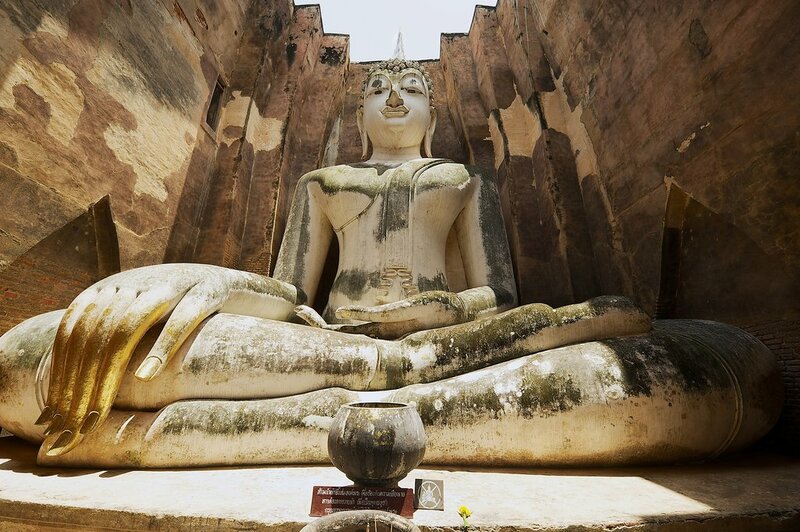 In the early evening, you'll get back on your bike and explore Sukhothai Historical Park. The park's ruins are some of the most impressive in the country, full of giant buddhas, conical stupas, and idyllic lily ponds. You'll have a guide on hand to explain the significance of the Sukhothai Kingdom in modern Thai culture, but you're free to wander around on your own if you'd prefer. 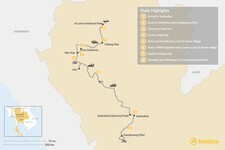 Today you'll head to the mountains about 2.5 hours away from Sukhothai to the unique town of Li. Organized in a grid system, the community was designed by a monk and is home to the Karen people, one of Thailand's hill tribes. Many of the stilt houses double as artisan cottage industries that produce sacred ornaments for temples, silk, or silver jewelry. You won't find this town in most guide books. For lunch, you'll dine with a local resident and self-styled hometown ambassador who will give you an insider's tour of Li. Later in the afternoon, hop back on your bike and get ready for a breezy, rolling descent north to the town of Hot in the Ping Valley. Spend the night there in an eco-guesthouse filled with beautiful antique glass and wood finishes. 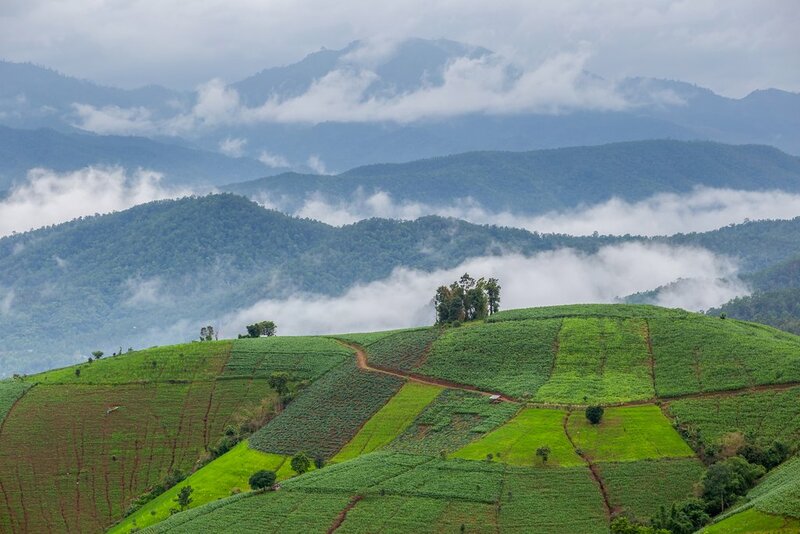 The rolling hills of Chiang Mai Province. Leaving Hot, you'll hop on your bike and cycle about 37 miles (60 km) through several small villages and neighborhoods of Chiang Mai Province on your way to Rim Kan village. For dinner, you'll be welcomed into the beautiful home of a local resident full of charming repurposed antiques from Northern Thailand and Burma. Choose between a rustic homestay here in the bungalows of a longon fruit orchard, or spending the night in a hotel that was once a 100-year-old tobacco drying center. 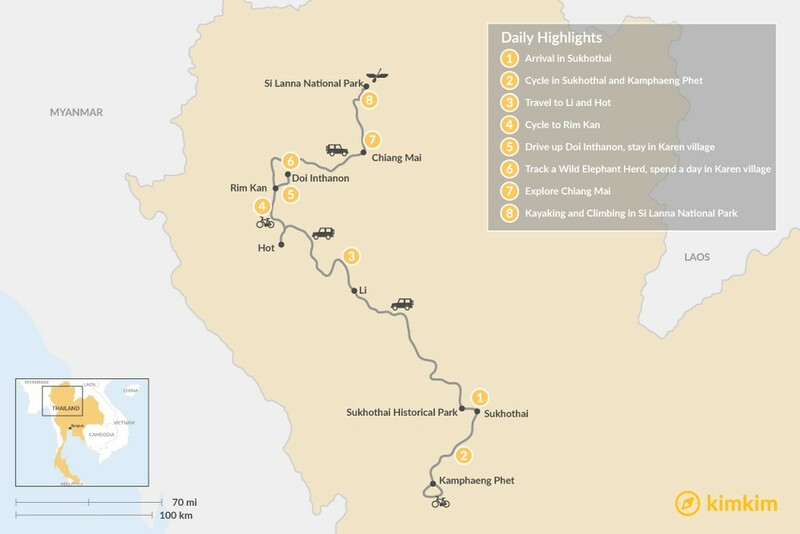 Today you'll drive up to the highest point in Thailand at Doi Inthanon National Park. The park is full of leafy nature trails, viewing platforms, pretty pagodas, and stunning waterfalls. On the way to the top, you'll stop and stretch your legs, and discover a 98 foot (30 m) waterfall. 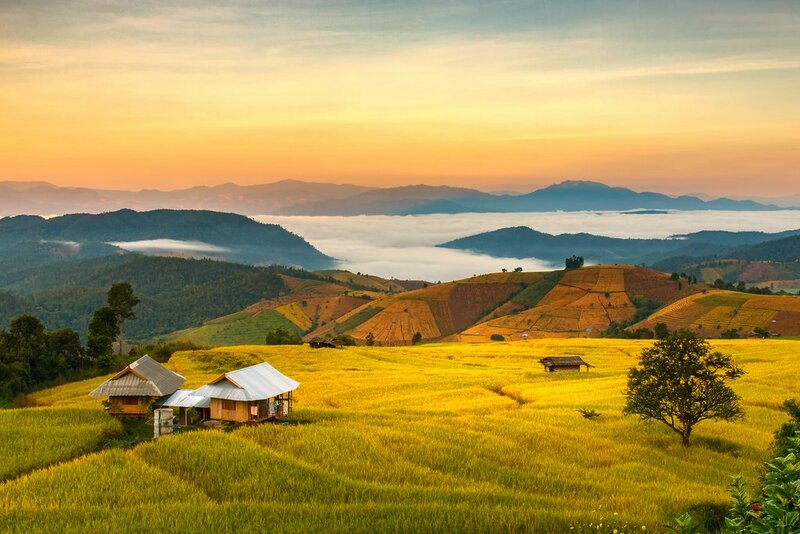 From there you'll continue on to a Karen village in the lush, hilly district of Mae Chaem in Chiang Mai province. 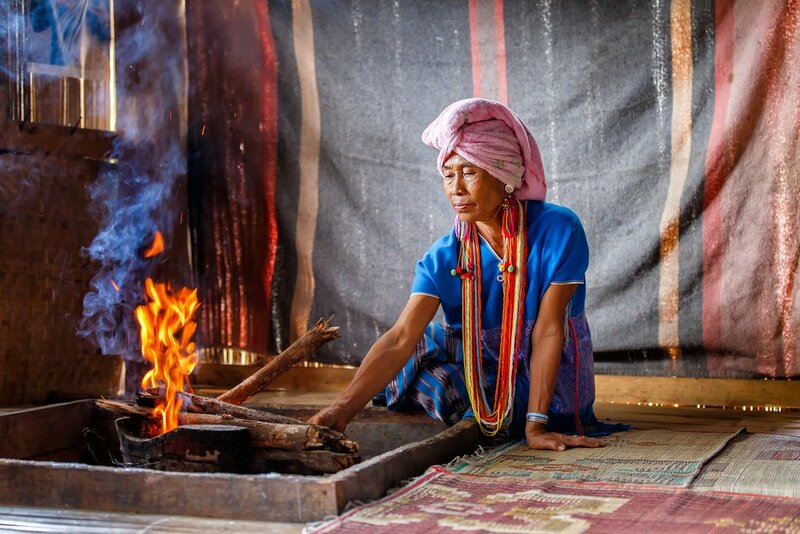 The Karen people are originally from Burma, but settled in the northern Thai mountains decades ago. They speak their own unique dialect and are known for their incredible weaving skills. When you arrive in the village, you'll meet your host family for the next two nights. Immerse yourself in fascinating Karen culture, cook dinner with your host family, and learn to weave a basket with one of the village elders. Wake up early for a morning hike in the forest. You'll spend about an hour and a half tracking a wild herd of majestic elephants. Feed them fruit snacks and help the experts carry out a health check. Spend your morning learning about these delightful pachyderms and then eat lunch with them in the forest. In the afternoon, you'll have the opportunity to take part in a community teaching volunteer project in the Karen village. Thailand's booming tourism industry means that learning even a bit of English can help underprivileged local people make ends meet. Drop by a local school to assist teachers in the classroom and help kids improve their English skills. 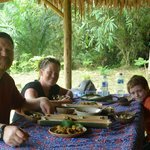 Enjoy the second night of your homestay with your Karen hosts. Hang out and bond with the elephant herd one last time before heading to Chiang Mai in the afternoon. You'll have the whole evening to explore northern Thailand's largest city on your own. 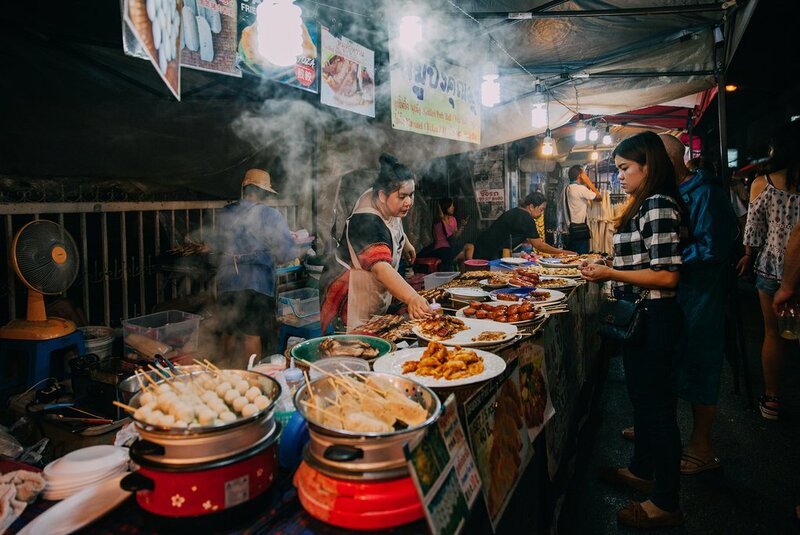 Shop till you drop at the famous night market where you can haggle for souvenirs, sample amazing street food (or even try more adventurous delicacies like insects! ), and admire the arts and crafts. 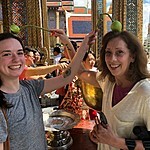 Then head out for a night on the town and check out Chiang Mai's many trendy bars and clubs, or simply pamper yourself with a foot massage. On your last morning, you'll set out for Mae Ngat Dam in a massive reservoir bordered by mountains in Si Lanna National Park. Get on the peaceful waters and kayak for about two hours to a floating restaurant for lunch. Feast on fried rice, spicy salads, and hearty grilled meats. There is a whole group of floating bungalows, restaurants, and hangout spots here, so feel free to lounge around and sunbathe on one of the decks. Or jump right in the water for a refreshing swim! In the afternoon, take a long-tail boat back to the dam. 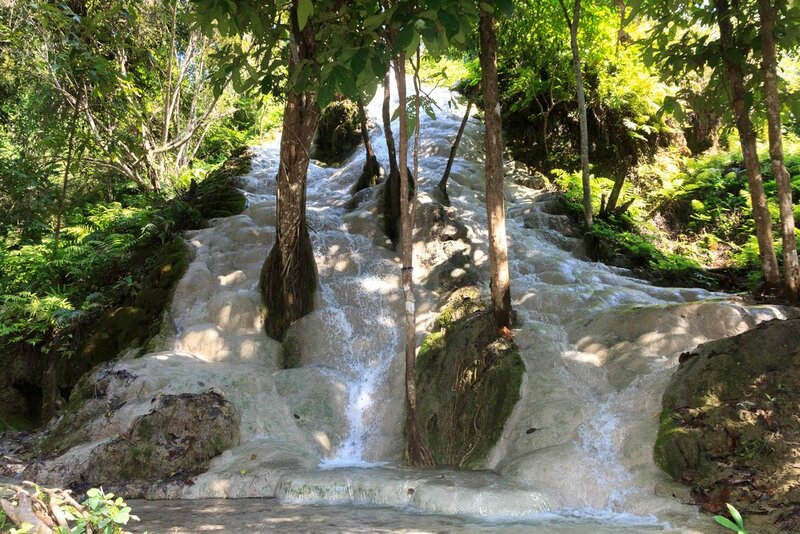 From there, take a quick scenic drive through shady mountain passes to get to the Bua Thong Waterfalls. The calcified limestone rocks under the water are porous and feel "sticky" when wet, making them easy to climb. Make your way up the waterfall barefoot, or take the path alongside. Then get ready to say goodbye to Thailand and head to the airport for your onward flight.